Health Aid Selenium has antioxidant properties which helps the body's immune system and thyroid function. Selenium protects tissue cells against oxidative damage and can maintains healthy hair and nails. Selenium Plus is a specially fortified with vitamins A, C, E and Zinc, to provide a powerful antioxidant combination with great free radical scavenger properties. 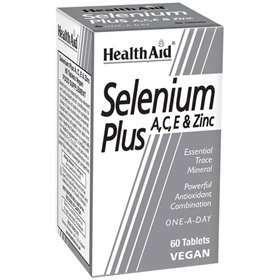 Health Aid Selenium is made using sodium Selenate for effective absorption. Free from yeast, gluten, wheat, dairy, salt, artifical colours, preservatives and flavourings. Could be beneficial to those exposed to environmental pollutants and chemicals, heavy smokers and/or drinkers, those wanting to maintain a healthy heart or reduce free radical damage such as ageing. Supports healthy immune and thyroid function and maintains healthy skin, hair and nails with its antioxidant protection. Bulking Agent (microcrystalline cellulose, di-calcium phosphate), Vitamin C (ascorbic acid), Vitamin E (d-alpha tocopheryl succinate, soybean oil), Anti-caking Agent (silica, veg. magnesium stearate), Stabiliser (croscarmellose sodium), Glazing Agent propyl methyl cellulose (HPMC), glycerine, titanium dioxide, Zinc Citrate, Vitamin A prep (retinyl acetate, acacia gum, sucrose, corn starch, corn oil, dl-alpha tocopherol), Binding Agent (acacia gum), Sodium Selenite.